For a democratic secular Iran. For peace and prosperity in the Middle East. : Ayatollah Khorasani: Sunnis are Kaffir! One day after the interfaith dialogue between the Catholics and Muslims and Hussein Nasr doing his usual charm waffle to fool the non-Iranian delegations, Shiite cleric, Ayatollah Vahid Khorasani, according to Sunni News website publicly quoted some dubious Hadith and concluded that the Sunnis are Kuffar!! every one have enough freedom to choose his religion . this is Ayatollah Boroujerdi's belife and he advocated of freedom in religion . You see!! These people consider themselves followers!!! How about being partners in the struggle for freedom? People did not "follow" Thomas Payne or Benjamin Franklin or Thomas Jefferson in the American Revolution, they cooperated - not followed. The French revolution was not kicked into gear by one man, let alone, a man from the church claiming that church and state should be separated. I think Baroujerdi is more dangerous than we can understand at this point. I must say, good point Barmakid! A point I have always made. No one man represents all of Iranians. In opposition to the religious dictatorship in Iran, we all represent or are aligned to different sections of Iranian views. We should all be partners and not followers. Is this ayatollah Vali Nasr's father?? 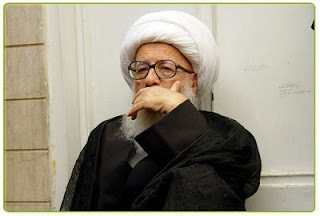 how much you know Ayatollah Boroujerd?i do not know where you liveing and what is your belief about him? at last i was one of Basej group but when i read resaley-azadi (one of Ayatollah Boroujerdi books)i know that i was in mistake.yes i support Ayatollah Boroujerdi and follow him .if you can understan farsi i can send this book for you by email. my english language is so bad sorry for it. فعالان حقوق بشر در ايران : ماموستا ايوب گنجي روحاني اهل سنت کرد در تاريخ 7 بهمن ماه سال گذشته به دليل ايراد خطابه اي انتقادي توسط نيروهاي امنيتي بازداشت و مورد شکنجه و اذيت و آزار قرار گرفته بود ، سرانجام با قيد ضمانت و اخذ تعهداتي چون " لباس کردي نپوشند ، به مسجد قبا نروند و سخنراني نکنند " در تاريخ 11 مهرماه سال جاري از زندان همدان آزاد گرديد. بنا بر گزارشات دريافتي آقاي گنجي مجددا در تاريخ 5 آبان ماه سال جاري بازداشت و به زندان مرکزي همدان منتقل گرديده اند ،گفته است بازداشت ايشان در پي برگزاري دادگاه رسيدگي به اتهامات نامبرده صورت پذيرفته است ، از زمان بازداشت ايشان تا کنون و همچنين دادگاه رسيدگي به اتهامات ايشان اطلاعي در دست نيست . نامبرده بنا بر نظر پزشکان کماکان نيازمند مراقبت و درمان مي باشد. tahereh i am very interested in the book. can you please send any info on the book by email? im sorry to contact you in this way i cant directly write to you by email. I checked Ayt. Vahid Khorasani website. His opinons about sunni is very respectful. Please do not slander another muslim when you know nothing! I have quoted the source that claimed this. The source, Sunni News also says the item was then removed. In any case the point made here is not Ayat Khorasani, the point is when even Sunnis and Shiites are having a go at each other what chance for inter faith dialogue. If Ayat Khorasani never said such things, then the fact that Sunni News has lied about shows there are serious inter faith problems here which need to be irone dout first.